A few weeks ago I made a fantastic seafood cheddar corn chowder. 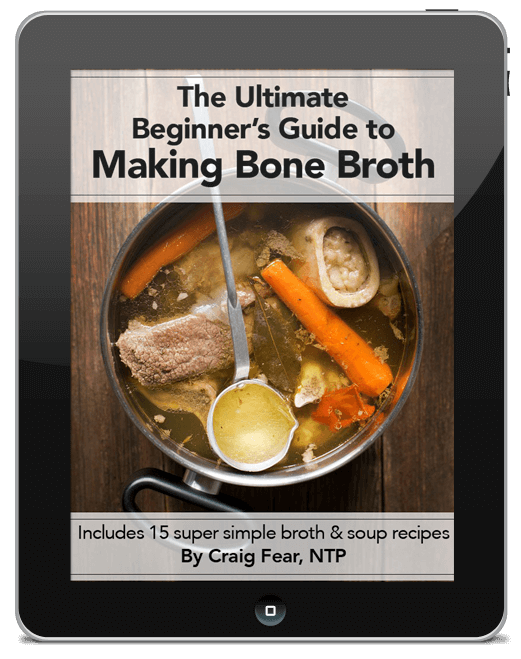 It got such a positive response that I started thinking of other creative ways I could make chowder. Since it’s October, I thought about a pumpkin chowder. Yeah, I know what you’re thinking. Every food blogger and their mother is trying to come up with attention-grabbing pumpkin recipes right now. But seriously, I challenge anyone out there to come up with a non-pumpkin pie pumpkin recipe that is better than this one! Because I also decided to go one step beyond just a pumpkin chowder. I had a bunch of frozen fish stock and thought that a pumpkin seafood chowder could be even more interesting and a simple adaptation from the seafood cheddar corn chowder. So off to my nearby farm I went to pick up some pumpkins! When I got to the farm there were some scruffy looking pumpkins labeled “pumpkin pie pumpkins” and the usual jack-o-lantern pumpkins. I was told by one of the farm workers that the pumpkin pie pumpkins (also called “sugar” pumpkins) were the best to use for their sweeter, starchier flesh but the smaller jack-o-lantern pumpkins could also be good to use as well. Curious to see the difference, I picked up one of each. 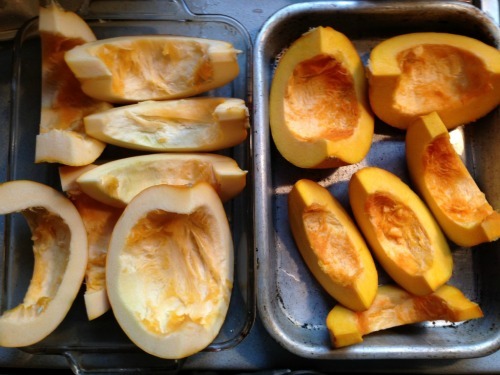 To roast pumpkins, cut them in half and scoop out the seeds and stringy flesh that contains them. Cut the halves into further smaller pieces and roast at 350 for about 45 minutes until the flesh is tender. 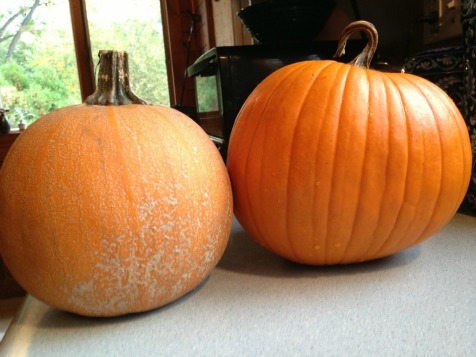 When I did this I could clearly see the difference between the two pumpkins. The jack-o-lantern pumpkin is on the left. But the biggest difference was the taste after I finished roasting them. The pumpkin pie pumpkin tasted sweet and tender. The jack-o-lantern pumpkin tasted as dry and flavorless as it looked. So much so that I didn’t even use it in the soup. But I did roast the pumpkin seeds! Anyway, so I learned my lesson. 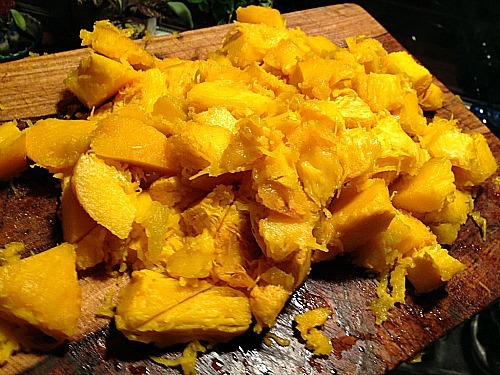 Make sure to use the sweeter pumpkin pie pumpkins. If you’re a pumpkin pie-making veteran you’re surely thinking, “No duh!” If you’re shopping in a local supermarket, these will probably be clearly labeled as such. Once roasted, scoop out the flesh. The skin should peel from the flesh fairly easily. Discard the skin and chop up the flesh. Now we’re ready to make the pumpkin seafood chowder! 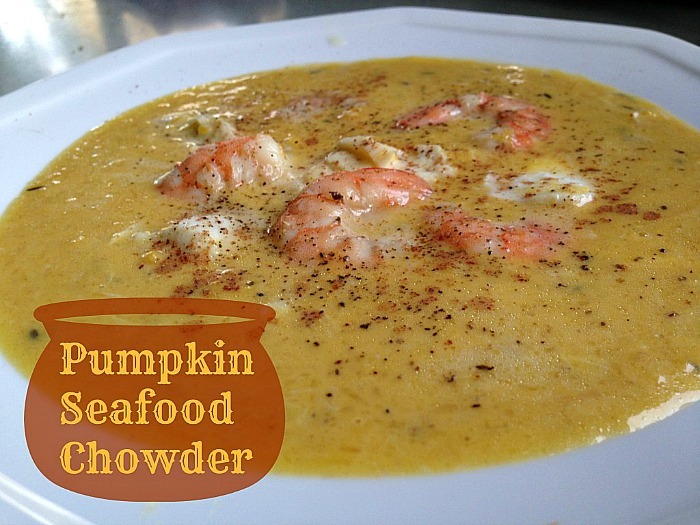 Pumpkin chowder is a fun Fall recipe but a but pumpkin seafood chowder is a more creative version for the true chowder buffs. Prepare, roast pumpkin and remove flesh as described above. Use a hand blender or immersion blender to puree ingredients together. 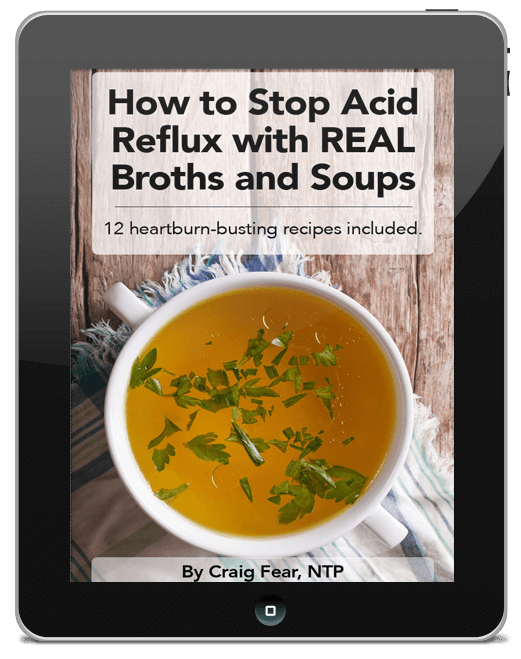 Do this before you bring it to a boil to prevent hot splashes from burning you! Bring to a boil, reduce heat to a gentle simmer and cook for 10-15 minutes. Slowly add in brown sugar, salt and pepper, cumin and coriander, tasting as you go to find what works for you. Add in seafood and cook a few minutes til shrimp and fish are cooked through. Ladle into bowls and top with a pinch of nutmeg. 1. Double up the ingredients for a huge pot for additional meals throughout the week and for freezing. 2. Add any seafood you like - lobster meat and scallops would work fine as well. 3. Add some ginger and garlic with the onions. 4. Top with a dollop of creme fraiche or sour cream. 5. Don't like seafood? Substitute chicken stock for fish stock and leave out the seafood for a more straight forward pumpkin chowder.